Yuketen is proud to offer Italian-made Norwegian-welted shoes in addition to our Goodyear welt and moccasin styles. 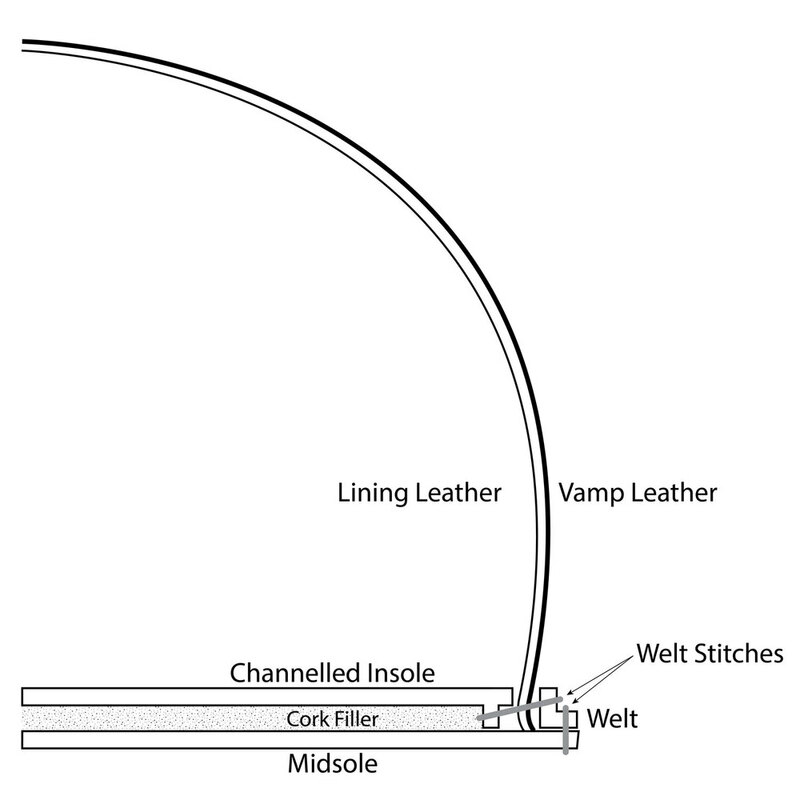 The Norwegian welt (also known as a "storm welt" or "water proof welt") is notable as it prevents water from entering the shoe at the seam between the shoes' upper and the welt. This area can be a problem for traditional Goodyear-welted shoes in wet conditions; as an alternative, Norwegian welts have historically been used on ski boots and performance footwear. Rather than curving beneath the shoes' upper leather as a traditional welt would, the Norwegian welt is completely exterior. As this is the case, the stitching that pierces the upper leather and connects the welt to the insole is visible on the outside of the shoe (not so with Goodyear-welt construction). The construction of the interior of the shoe shares many features with Goodyear-welt construction, though, including a channeled vegetable-tanned leather insole and steel shank. A steel shank, foam heel pad and vegetable-tanned leather heel pad surround the insole within the shoe. The heel pad and steel shank provide a measure of structure in the rear portion of the shoe, while still allowing the shoe to flex where necessary at the ball of the foot. The pad and shank also work to provide a stable bridge along the arch of the foot, allowing pressure to be spread and diffused more evenly across the bottom of the foot, resulting in a more comfortable shoe. The foam heel pad provides a final layer of shock absorption and the leather heel pad, in conjunction with the leather insole, provides a full vegetable-tanned leather footbed from heel to toe. The shoe's upper and interior components sit atop a full leather midsole, stacked leather heel and an Italian-made Cortina lug sole. The Norwegian welt brings a ready-for-anything element to Yuketen's fine leather footwear and is finished with Yuketen's iconic pinking, solidifying the Norwegian-welted shoes within the Yuketen line up.